Describe the problem in a simple sentence. You could see a film loop of it mentally or get the feeling or words clearly in mind. Focus it down. If it’s pain, what kind of pain? Nagging, dull or endless…describe it. If you have anxiety, about what? Get as precise and succinct as possible. It can be a physical, emotional, mental or spiritual problem, past, present or future. Be specific! Global statements don’t work as well as specific ones. Rate the problem, the pain or the emotional feeling. On a scale of 1 – 10, how bad is it? 0 is nothing, 10 is the worst. This optional step helps you to keep track of the work. 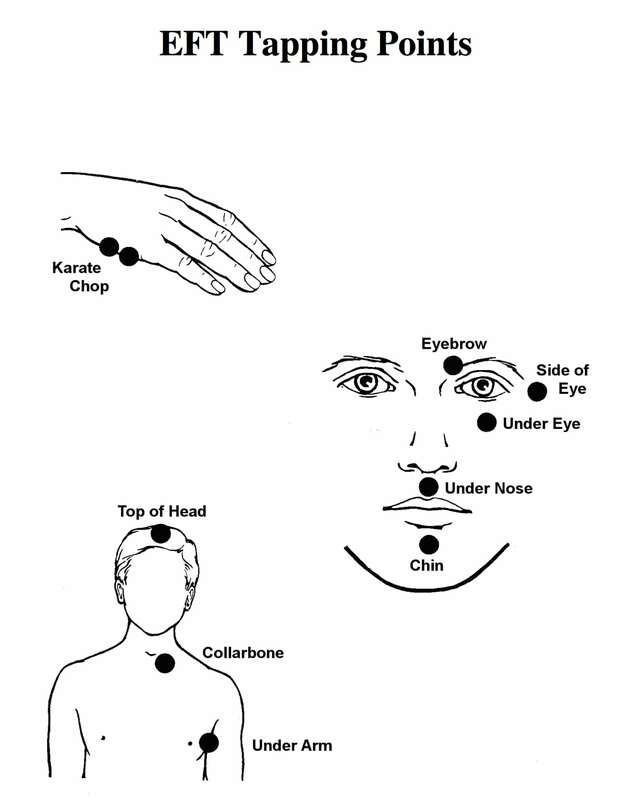 Tap on the “karate chop” area of your hand, as you make the statement below. “Even though I have (_________), I accept myself and my feelings.” Do this three times. Then, as you tap firmly on each of the points listed below, make a short reminder statement of the problem, such as “headache pain” at each point. You may tap 2 or 3 rounds on the points below. Tapping on each of the following points is one round. Tap about 5-6 times on each of these points. You can use both hands, or either one. Tap on the inner edge of the eyebrow, and make a reminder statement. Tap on the outer edge of the eye, at the temple, and make a reminder statement. Tap below the eye, at the edge of the bone, and make a reminder statement. Tap below the nose, in the groove above the upper lip and make the statement. Tap in the crease below the lower lip and above the chin and make the statement. Tap the inner edge of the collarbone, just below the knobs, make the statement. Tap on the side of the body, about 4 inches below the center of the armpit, and make a reminder statement. Tap on the top of the head and make a reminder statement. Take a deep breath and sit quietly. Listen or feel or view whatever comes up. Rate the problem again. If it has gone to 0, then you are done! If there is more left, you can do the procedure again, changing the statement slightly. Say, “Even though I still have some (_________________), I accept myself.” Repeat as needed until it clears. You may tap on either side of the body, or both sides at once. You may reinforce this during the day by repeating the statement to yourself and tapping. If it is a long-term illness, weight issues, aging concerns; these take persistence! Just keep tapping! It is very important to seek help if the condition worsens, or in acute illness or injury. Sometimes doing this tapping will bring up memories or other aspects of the problem; just tap on those until you feel calm. Sometimes it takes tapping for a few minutes, 3-5 times per day up to a few weeks to complete a complex problem. If the other aspects are difficult, painful or distressing, start at the beginning with each one of them. Please call me at 208-784-3101 if you have questions or would like coaching. As with all self-help techniques, you assume full responsibility for your own results. Check out the video above! I always love to hear what you’ve gained from Emotional Freedom Technique (EFT). Please reach out to share your victories.